Dr. Shannon is the project coordinator for the Embedded Instruction California Pilot Project which involves the implementation and evaluation of a variation of the Tools for Teachers, professional development program. Her research interests include pre-service and in-service professional development, coaching that supports teachers’ acquisition and sustained use of evidence-based practices, and system-level policies and mechanisms designed to enhance continuous improvement. 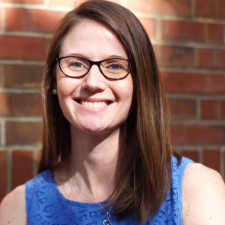 Dr. Shannon earned her doctor of philosophy degree in 2017 and a one-year post-doctoral fellowship complete in 2018 at the University of Florida. Her major area of study was curriculum and instruction with a minor in early childhood studies. Her dissertation was titled Exploring Coach-Teacher Interactions within a Practice-based Coaching Partnership. The purpose of this research was to explore how coaches facilitated conversations during the debrief meeting component of an onsite Practice-based Coaching partnership. A direct behavioral observation system was developed to investigate (a) the proportion of time spent in different conversational foci, including who initiated the conversation; (b) the verbal behaviors used by coaches; and (c) whether the conversation foci, initiations, and coach verbal behavior changed across three occasions for seven coach-teacher dyads. As a doctoral student, Dr. Shannon was involved in two Goal 3 projects funded by the Institute of Education Sciences that focused on professional development to implement evidence-based practices in inclusive preschool settings and the nation-wide implementation of Leadership Academies and Practice-based Coaching Trainings with the Head Start National Center for Quality Teaching and Learning. Prior to enrolling in the doctoral program at the University of Florida, Dr. Shannon had 10 years of experience teaching in school- and center-based inclusive early childhood programs, and providing professional development to teachers and administrators in public, private, and Head Start settings. Bondy, B., Shannon, D., Castaneda, M., & Munarriz-Diaz, R. (2017). Re-centering job-embedded graduate education for practicing teachers. Teacher Education and Practice, 30(1), 38-56. Poekert, P., Alexandrou, A., & Shannon, D. (2016). How teachers become leaders: An internationally validated theoretical model of teacher leadership development. Research in Post-Compulsory Education, 21(4), 307-329. Shannon, D., Smith, S., & Dana, N. (2016). Practitioner research in early childhood education and care. Infants & Young Children, 29(4), 312-334. Shannon, D., Snyder, P., & McLaughlin, T. (2015). Preschool teachers’ insights about web-based self-coaching versus on-site expert coaching. Professional Development in Education, 41(2), 290-309. Whalon, K., Martinez, J. R., Shannon, D., Butcher, C., & Hanline, M. F. (2015). The impact of reading to engage children with autism in language and learning (RECALL). Topics in Early Childhood Special Education, 35(2), 102-115.